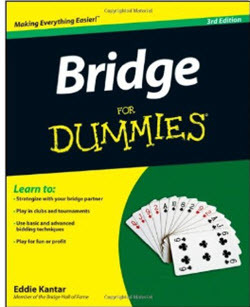 Bridge for Dummies is an excellent choice for everyone who wants to learn bridge. Bridge Basics is a good book that focus exclusively on the basics of bridge.. The perfect book for anyone who are looking for a focused well written book for beginners. Bridge for dummies is an excellent book for beginners who want to learn everything about bridge. Brdige Basics one is a short book that makes it easy to learn bridge. 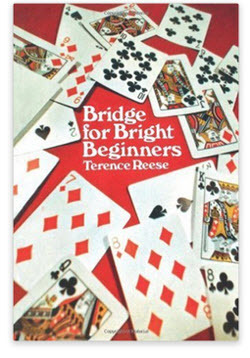 Bridge for BRIGHT Beginners has been on the market for a long time but remain a good choice. Welcome to Wednesday game. A website devoted to helping you choosing the right books to help you learn to play bridge, Bridge is a complex game and learning bridge can seems like a very daunting task. This is not a completely false feeling. Bridge is harder to learn than most other card games and it can take a life time to completely master. This should not discourage you from learning bridge. It does not take very long, and it is not very hard to learn the basics of bridge. Once you have learned the basics you can start playing bridge and learn more as you play. This makes the learning process a very pleasant task. You learn while you play. If you want to increase your rate of learning you can read different bridge books that feature information suitable for your skill level. Whether or not you should read books on more advanced bridge once you have master the basics depends on why you want to play bridge. If you just want to play with friends and other local bridge players you might not need to read about more advanced strategies. At least not if your opponents are less advanced players as well. In this case it can be more fun to develop into better players together as you play. If you advance too high you might find that local players no longer want to play with you since you are above their skill level. If your goal is to become a tournament player you need to do everything you can to learn as much as possible about bridge and advanced bridge strategies. To do this I recommend that you read everything you can find on bridge and use bridge related software to run different simulations. I recommend that you read good and bad books a like. There is often at least some good information even in bad books. If you want to become a truly advanced players you should not only read modern books but you should also try to read older books. Reading about old no longer used strategies can make you think about bridge in a new way that gives you an edge towards other bridge players. I also recommend that you start playing bridge online. Playing online allows you to quickly gain experience that would take years to get playing regular games. If your ambition level is somewhere in between these two alternatives you need to adjust your studies accordingly. Try more card games at an online casino if you want to try to win some money at the same time as you enjoy yourself playing. Before you choose a casino and start playing, be sure that you get a good bonus or a large amount of freespins to get the most out of your games and the money you stake. Keep in mind that casino games often are very addictive and that you might lose a lot of money if you'r not careful. It is very important to remember that bridge is a game played in pairs. You will therefore have to consider your partners ambitions as well. You can not focus exclusively on yours. It does not matter how advanced player you become if your partner only want to play for fun. You will not do well in tournaments. If your goals are very different from your partner you will either have to accept it or find a new partner that is as ambitious as you are. From this point on we are going to focus on books and texts that are suitable for anyone who wants to learn more about basic bridge strategies. We will review books suitable for all skill levels but below we will focus on beginners as we think they are the players who need the most guidance. We want to make sure that they get of to a good start. The advice we give below about choosing a suitable book can be ignored by more ambitious players. An ambitious players should try to read everything. All players regardless of ambitions should read a good beginner book as their first introduction the bridge. When choosing a good book to read you should be looking for a well illustrated and well written book that focus on bridge basics. If the book goes into more advanced strategies too soon it can be hard to digest the information. The same is true if the book mixes basic and more advanced strategies together. This make the basics of the game seem harder than they are. A good beginner book should also contain a lot of practical examples, exercises and quizzes: Quizzes allows you as the reader to see if your remember and have understood what you red in the last chapter. As a beginner you should avoid all old books. The reason for this is that bridge has developed a lot during the last 30 years and an older book might contain information that is no longer relevant and strategies that no longer work well. 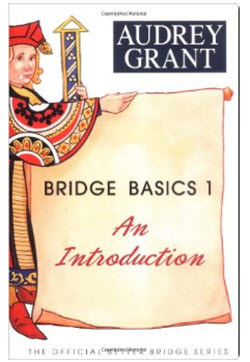 Some of the best beginner books that we have found includes Alan Truscott's Bridge in 3 weeks, the bridge in the 21st Century series, bridge for dummies, bridge basics 1 and Bridge for Bright Beginners.